Below is an image and writing from Dr. Caroline Lear, School of Earth and Ocean Sciences, who spoke at last night's Beasts of the Southern Wild event. In – at least - Hushpuppy’s imagination, melting ice sheets are the cause of the disastrous flooding in Beasts of the Southern Wild. Relating this to our current climate, if the Greenland ice sheet were to melt completely, sea level would rise ~7m and Chapter Arts Centre (in Cardiff) would become very soggy. As a geologist, I am keen to study the past behaviour of Earth’s ice sheets with a view to determining how they respond to long-term climate change. I do this indirectly, using proxy evidence. One of the most important “proxies” is the oxygen isotope ratio (18O/16O) of tiny marine fossil shells called foraminifera. The oxygen isotope ratio of the fossil shells can be used to determine how salty the oceans were thousands and even millions of years ago. This measure of saltiness can be used to determine how much fresh water was locked up in ice sheets through time. It seems that when levels of atmospheric CO2 were higher in the past, global climate was warmer, and the oceans were fresher. Indeed, around 50 million years ago there were no major ice sheets on the surface of the Earth. Such proxy records suggest the presence of very large ice sheets from about 34 million years ago. 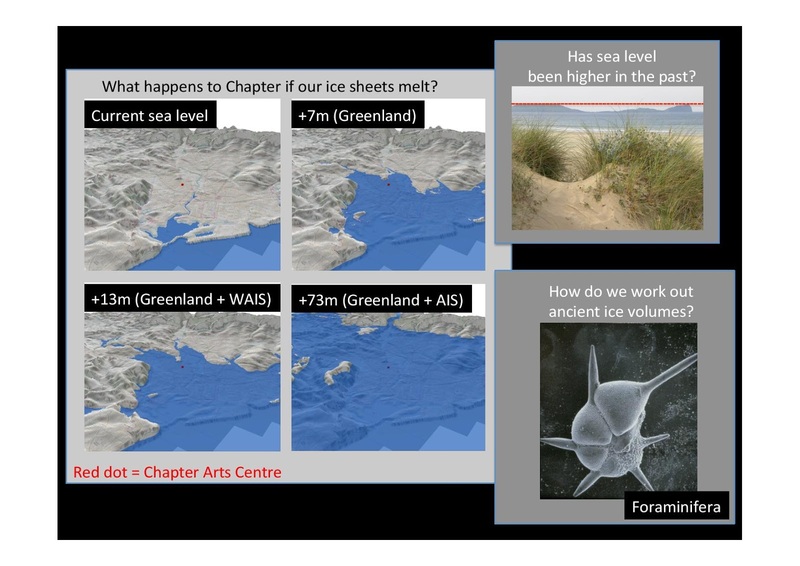 Current ice sheet models find it difficult to reproduce the same degree of ice volume variability that we reconstruct for these early ice sheets, which may have implications for our confidence in their predictions of future ice sheet change.